This morning will drinking my cup-o-joe, I came across this entertaining and interesting demo video of the TC Electronic Ditto Looper X2. This is the new improved version of the TC Electronic Ditto. Larger footprint, but additional functionality and some great new features like reverse and half speed settings. The video by TC Electronic features Paul Gilbert on guitar and was interesting to see how physically committed he is when he plays guitar. I knew he did the the classic “guitar face” but I guess I forgot. Good stuff. I like people who play.. that are “all in” regardless of situation or circumstance. That’s cool. Features of the TC Electronic Ditto X2 include a dedicated start/stop button. 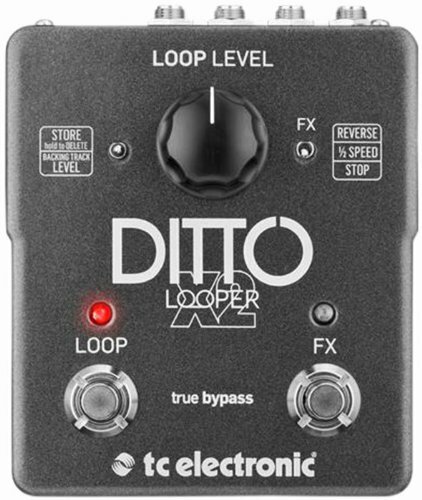 The original Ditto Looper only had a single footswitch (if memory serves me correct – it was a double tap to stop). The dedicated start/stop button is very important in my opinion. Like I mentioned above, there are 2 effects – Reverse Mode and Half Speed modes. You can also interface with the pedal and import/export backing tracks. If this is something you’re interested in you can pick up the TC Electronic Ditto X2 for $169.99 at Amazon.com! next pedal purchase, I’m glad I passed on the first model . . . . though, that was good too. just have to finish buying my last bunch of pedals and the bunch before that bunch!